Emily Ross is a young geologist and artist exploring the intersection of geology and art around the world as a 2017 Watson Fellow. After spending a month at Villa Lena, Emily gives us an hint about the geological analysis of the property and geological tips for the area. The complex geology of Italy is largely responsible for Italy’s rich art history, from the renaissance marble of Carrara to the iron-rich clay of majolica pottery. The active tectonics of the region cause earthquakes, volcanic activity, uplift, and erosion, as the African and Eurasian plates collide. In Tuscany, this constant change has created the dramatic hills and cliffs that surround Villa Lena. The landscape is sculpted by the erosive power of water acting on young (geologically speaking), soft sediment left behind by an ancient sea. Evidence of this ocean environment can be found all around Villa Lena. Sculptural grey limestone concretions, fossilised shells, preserved casts of animal burrows, and sandy cross-bedding all indicate a calcium-rich ocean environment, in which rivers draining from nearby continents provided vast supplies of sediment. Just as renaissance artists and scientists studied human bodies in order to better represent them, they studied the rocks of Tuscany in order to more accurately depict them and understand the way the Earth works. The drawings of da Vinci, in particular, demonstrate an interest in the sedimentary layers of the landscape and their interaction with water. The Galileo Science Museum, in Florence, is filled with scientific instruments that dance with sculptural beauty and craftsmanship. The Museo di Storia Naturale di Firenze hints at the wonders hidden in Tuscany’s loose sediments, reconstructing entire seafloor environments using fossils. Outside of institutions of science, pay attention to the building materials of local buildings in the small towns, which can give clues to the layers of harder bedrocks hidden under the soft erosive materials. Patient rock hunting along the beaches of Cinque Terre lead to more delightful surprises as natural and manmade objects alike are smoothed and rounded by the relentless tumbling of the waves. In Siena’s Duomo, stunning marble slabs are framed and presented as works of art in their own right alongside marble works by Donatello and Michelangelo. The rocks of Italy blend the divide between the natural and manmade universes that the Renaissance sought to reconcile, bringing scientists and artist to celebrate and fear Vesuvius, hunch over to inspect a pebble, or dig clay to reshape with their own application of geology’s ever-present ingredients: pressure and heat. The imposing Palazzo Pitti in Florence contains many treasures. An overwhelming number of them are at the Palantine Gallery, the royal apartments from Medici to the Lorraine to the Savoy families, and briefly was the seat of the Italian king when Florence was the capital of the newly minted Italy. In short, the Palantine Gallery is a condensed and an intense historical imprint of centuries of unfathomable wealth, power and international connoisseurship. The decor, collection and valuable objects are displayed as they would be when the monarchs were living there – all jumbled up and arranged to translate the sense of spectacle of riches the palace used to be. It has, among other things, the largest collection of paintings by Raphael, important pieces by Titian, A Sleeping Cupid by Carravagio and a powerful Rubens. The portraits of reigning families preside over luxuriously draped walls, whilst each ceiling is a masterpiece of frescoes or grisaille or stucco. The floors change from terracota tiles inlaid with stones to hand-painted ceramics. The walls are filled with hidden doors through which servants and monarchs would make their escapes, and tables and cabinets are made of rare ebony and pietro duro. To sum it up, this is the splendour at its peak. Go in the late afternoon when the crowds are at their ebb, and if you are lucky it will be just you, a few Raphaels and a glamorous Florentine elderly gallery assistant in the halls of Saturn, Ulysses and Prometheus. 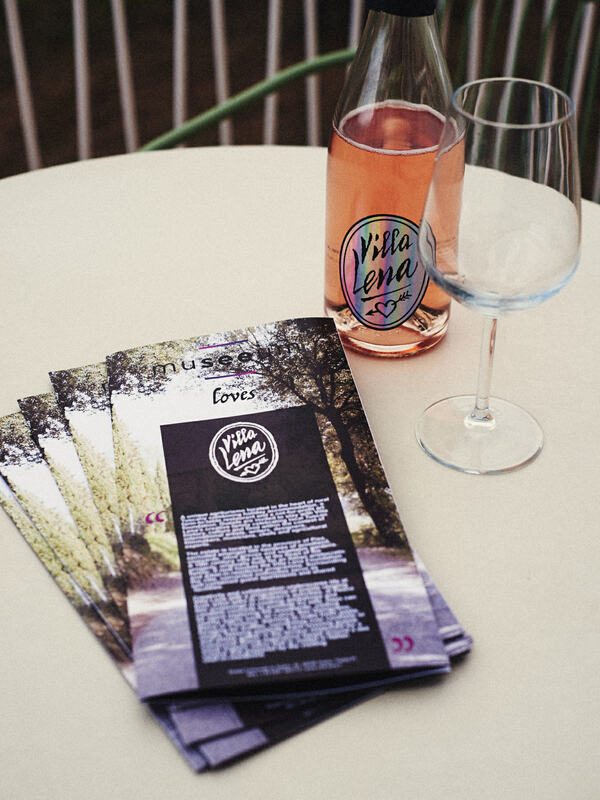 Since 2013, Villa Lena Foundation has established a working partnership with Il Bisonte print studio in Florence. Il Bisonte was founded in 1959 by Maria Luigia Guaita, who with the support of a group of Florentine intellectuals worked with a great diversity of artists and brought print making into the spotlight in Florence. Many artists, both italian and international have worked at Il Bisonte. Among Italians: Maccari, Bardini, Mattioli, Faraoni and Annigoni, and non-Italians: Lipchitz, Chadwick, Calder, Sutherland, Wunderlich, and Moore, to name a few. To date over twenty visiting residents have worked with Il Bisonte to create limited edition prints for Villa Lena Foundation. The techniques involved with creating an etching have changed little in the past fifty years and the process is a laborious but meditative one. The artists’ experience the tutorage and expertise of the team in the historical studio, and the resulting prints (Editions of 35 + 5 AP) are sold to benefit the foundation. In 2016 artists Kon Trubkovich (b.1979, Russia, lives and works in New York, USA. Resident in June/July 2016) and Craig Fisher (b.1976, UK, lives and works in Nottingham, UK. Resident in October/November 2016) were two of the residents who made limited editions. Kon worked on a portrait of his wife, Alex, using two plates – one so soft it recorded fingerprints, the other creating more traditional hard lines. Craig also used two plates but in this case each used a different colour, a soft pink and navy juxtaposition which was hugely successful and evocative of the Toiano scenes that inspired it (Toiano is an abandoned village close to Villa Lena: a source of great intrigue and inspiration!) and Craig’s studio practice. Florence, despite its small size, is an incredible place to shop. Apart from all the big brands and local markets, Florence has shops that are treasures, unique to the fabric of the city. Start on via dell Serragli, in an area called Oltrarno (the “other side” of Arno) at either Paolo Tozzi’s Domus Aurea or Luca Raffanelli’s antique shops for mid century Italian chic furniture or curiosity objects. Few doors down, towards the river, enter vintage and second hand shop selling vintage designer pieces and jewellery. At the bottom of via dell Serragli, turn right, on to Lungarno Guicciardini, for more antique and vintage shops. Walk towards via di Maggio, another street with antiques, and before crossing the bridge across the Arno, dip into Traslucido for more mid century Italian magic. Make sure to ask to show you their storage room – the pieces there are as beautiful as they are in the shop. Across the bridge, enter more pricier options. Start with the Ferragamo museum store on via Tournabuoni. The museum shoes are limited editions of the iconic designs by Salvatore Ferragamo made for the likes of Marylin Monroe and Audrey Hepburn. Don’t be fooled by the limited display on shelves, ask to see the closet behind the cashiers. For more luxurious shoes head to Aquazurra, a brainchild of Colombian designer settled in Florence. Although with stores in New York and London, his Florentine outpost is his headquarters, residing in the glorious Palazzo Corsini. Other notable Florentine establishments are Loretta Caponi, Richard Ginori and Santa Maria Novella. Signora Loretta Caponi started her business over 60 years ago, embroidering linen, towels, dressing gowns and night dresses. Now, her flagship store on via Tournabuoni is a vast expanse of best Tuscan embroidery and fabric – unique and antique pieces fill this enormous shop hidden behind a very modest entrance. Check out the night gowns – each takes 3 months to make and has unique designs. It is also great for baby clothes and gifts. And don’t forget to stop at Procacci’s just few doors opposite for a glass of wine and their famous truffle buns. Richard Ginori is a famous porcelain maker. Established in 1735, it was recently declared bankrupt, until Gucci, another Florentine-born company, bought it and restored to its glory. The shop itself is beautifully designed, with frescoed ceilings and a large winter garden. There are endless choices of dinner services, catering to every taste, whim and desire. And, of course, Santa Maria Novella is the most famous cosmetics shop in the city. Founded as a pharmacy by Dominican friars shortly after 1221, it is now a global chain selling perfumed soaps and moisturises, pot pourri and fragrance. Their Florentine shop is their HQ, and as usual, the setting is stunning, with the views of Santa Maria Novella church cloisters. To dress up your bambini, Florence offers great choices. Our favourite ones are Assunta Anichini and Cri – Cri. Assunta Anichini, located just off the Arno’s embankment, on Via del Parione, has an amazing selection of dresses and gowns for your little daughter and smart linen ensembles for your son. It also boasts glorious cashmere sweaters for the cold season. Cri Cri (Via Il Prato) is a labour of love. Run by a Florentine woman, it showcases beautiful items made in the shop, or sourced from other local artisans or brands, and antique clothes and toys. And finally, if you are looking for a nice piece of clothing but tired of main street brands head to Flow Store on via Vecchietti. They stock an interesting variety of contemporary local brands as well as lesser known but beautiful designers from around the world for both men and women. 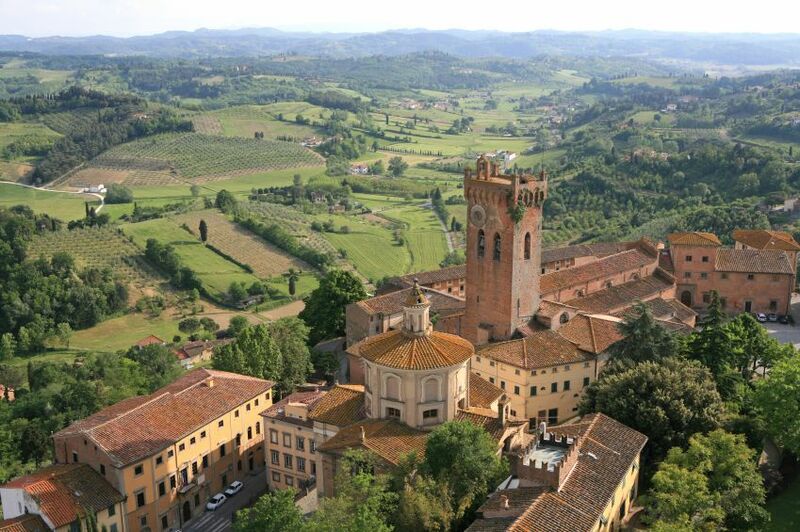 You can have more hints and tips about what to do in Tuscany, in our Local Area page. It is a habit of the Italians to turn all and any seasonal change, harvest, custom or historical date into a festival. Typically these festivals are community social events at which everyone enjoys a good gossip over a glass of wine, but they are also occasions for local artisans to congregate and sell their wares on a sea of stalls. One of the most charming of the summer was the Lari cherry festival in Tuscany – tables bursting with dozens of varieties of colourful cherries – children dripping cherry juices down their chins and all manner of cherry themed baskets, tablecloths and condiments. Lari is a spectacular medieval town with impressive squares, 15 foot walls and views of surrounding countryside. I bought as many cherries as I could carry then had a perfect expresso on the sun terrace outside the unassuming La Bottega delle Specialita and watched the world go noisely by. Lari is about 30 minutes drive from Villa Lena, and it holds the festival over two weekends in either May or June, depending on the weather and harvest. The dates are published in advance on local websites, as well as numerous posters found on every possible visible corner. Another great summer local festival is the black summer truffle festival — this is followed less than a week after the cherries. San Miniato is Tuscany’s answer to Alba, the truffle Mecca of Italy, although many (proud Tuscans perhaps) told me the truffles here are every bit as good. The black truffle festival was quite spectacular. Performers dressed as swans on slits, live music for all ages and tastes, endless wine tasting tables, light shows, food stalls, special truffle themed meals to be had at all the restaurants and even a brass band in the butcher’s shop. Aside from the truffles San Miniato has a high concentration of excellent gastronomic restaurants, a craft beer shop, great antique shops and a superlative gelateria. San Miniato is a short drive from Villa Lena, and in addition to the summer truffle festival they host white truffle festival in November. Local producers display not only fresh white truffles but an imaginative variety of truffle products – from truffle infused olive oil to polenta specked with truffle. Make sure to check the back of the label to see the percentage of the truffle in each product – sometimes its just the truffle infusion rather than the actual thing.